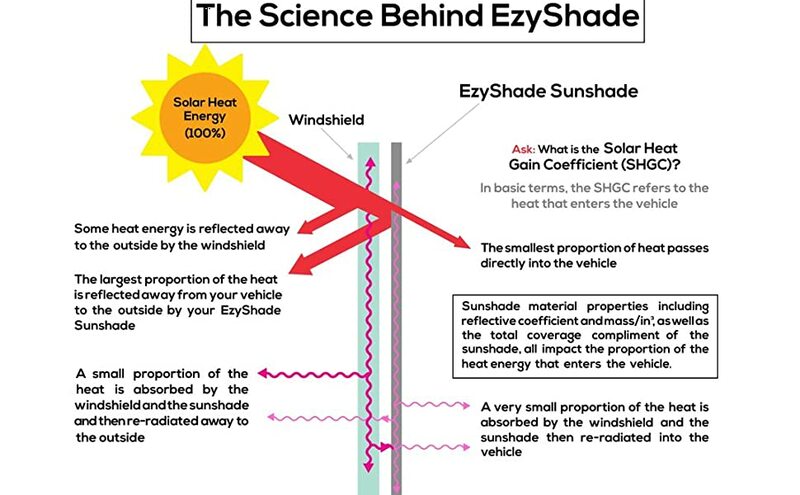 EzyShade have designed their sunshades to have the lowest Solar Heat Gain Coefficient (SHGC) available for a lightweight foldable style sunshade. On average EzyShade sunshades have a SGHC of 0.18, which translates to a whopping 82% reduction of heat inside your car. Most other sunshades don’t even come close. The secret is EzyShade’s unique 2 shade design combined with the most reflective black-backed tight weave polyester material currently available. The ultra-reflective material and the overlapping 2 shade design results in far superior heat and UV block-out. This means better protection for your dashboard and interior, and far greater comfort when getting back in your car! BEST COVERAGE. BEST FIT. Find your vehicle in the easy-to-read SIZE CHART. Don't persist with shades that don't quite fit right. EzyShade Sunshades are 2 identical rectangular shades. This allows for maximum adaptability to your car’s windshield. You can install vertically or horizontally to achieve the perfect fit. The overlap of the 2 shades ensures a better fit with superior UV block-out (over 99%) and unrivalled heat reduction (over 82%). EASY TO USE AND STORE. EzyShade has been designed for hassle-free use. There's no wrestling with these sunshades. 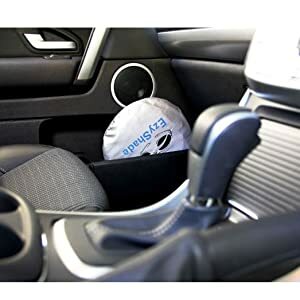 EzyShade is quick and easy to install and uninstall, and because it's 2 pieces instead of one large piece you can layer them over one another to fold away, and all whilst sitting comfortably in your car seat. KEEP COOL. Don't let the hot sun damage your car or your mood. The superior double shade design offers maximum coverage and efficient UV and sun protection (over 99% block out! ), keeping you and your loved ones’ cooler and happier when you step back into your car.